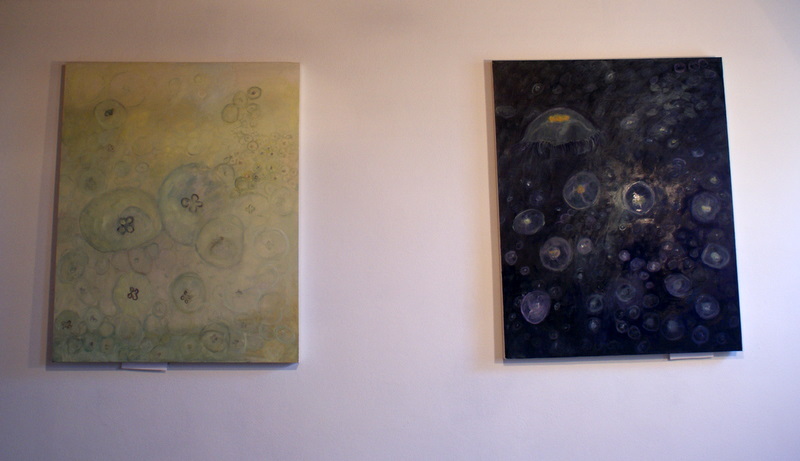 These are two paintings I am currently working on, whether they are finished or not, I am not sure yet. I started the dark one a few days ago and the light one only yesterday. I like the contrast; they are like opposites but of the same thing. These were inspired by watching a David Attenbrough nature documentary, called “creatures of the deep”. I was blown away by the haunting images of the jellyfish. A billion years before there was life on the earth, life began in the sea. 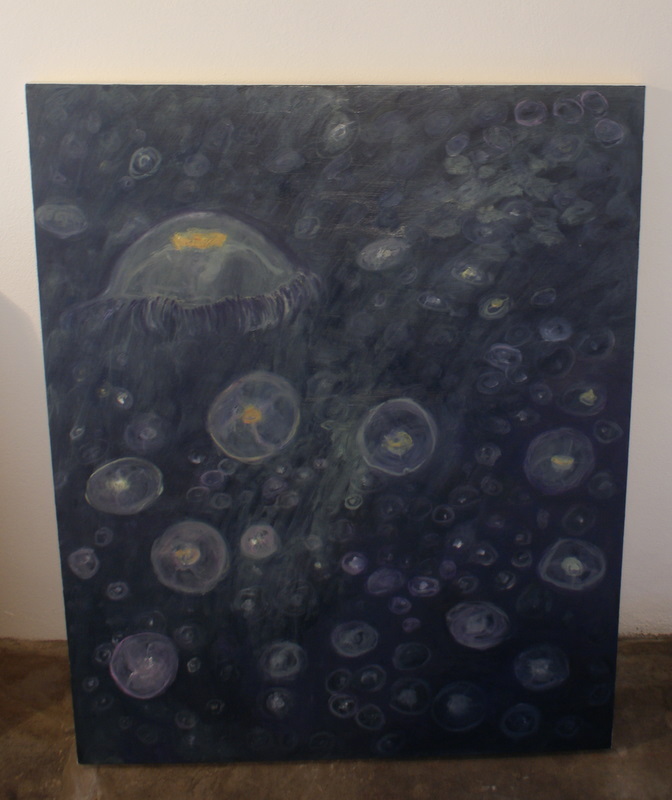 Jellyfish have no brains and no blood, I find them fascinating and really lovely to paint! As my painting is a lot about the process I am using the jellyfish as a starting point but allowing the paint and marks to have their own journey too. Building up layers of transparent glazes and opaque flatter areas, so it becomes deeper and quite dreamlike. These are very unique. I like them and wonder how they will turn out as you work on them. I am fascinated with the process a painter goes through to determine whether a painting is finished. Do you ever feel as if your paintings are finished? I guess writers have the same challenge. I find myself wanting to make changes in posts and manuscripts. I do like your description, “I took a few risks” and will remember that when I write. Thanks for your comment. I suppose when talking about finishing paintings, I feel more like I have done as mush as I feel capable of with a painting at that time, then it is finished in a fixed way. Though sometimes I am pretty sure they are finished, and the only way I could work on them more would be to create a really different painting. Sometimes I look at old paintings and still feel they are finished and sometimes I rework others, trying to remember what it was I was trying to paint about at the time, as it can be tempting to change old work to make it more about now, I think. I am not that confident about judging my work. I usually think that if I felt present and concentrated while I was doing it it is going to be better then if I was sort of distracted, but I am not even sure if that is a good way to measure it! Yes risk taking can be uncomfortable but I think it helps me move onto the next stage with my work. Good luck with your own writing and risk taking. Lovely, ethereal jellyfish – I really like the effect you got. Thank you very much. I just collected these paintings from an exhibition this morning. I love the way jelly fish move, it is ethereal, I wanted to capture this feeling in a still painting and not just how they look physically, so I am glad you like the effect. Sorry I thought I had posted your comment this morning when I replied to it!